Home » Answers to Jehovah’s Witnesses » Was the name Jehovah originally used in the New Testament? Was the name Jehovah originally used in the New Testament? Summary: Jehovah’s Witnesses teach that apostate Christians removed the name Jehovah from the Bible and that its “restoration” to the Bible and its constant use by Jehovah’s Witnesses mark them as the true Christians. However, there is overwhelming evidence that the New Testament writers did not use the name Jehovah. As their name signals, Jehovah’s Witnesses consider the name Jehovah to be an essential aspect of their religion. Indeed, they claim that their name and their regular use of the name Jehovah mark them as the true Christians. We will discuss that specific claim in the next article in this series.1 The main premise or basis for this claim is the use of the name in the Bible. Here Jehovah’s Witnesses object to the common practice in most translations of the Bible of using substitutes for the divine name in the Old Testament. Most English versions usually use “Lord” and occasionally “God” in place of the Hebrew name commonly expressed in English as Jehovah. This criticism of Bible translations applies specifically to translations of the Old Testament, since the name YHWH (Yahweh, commonly translated Jehovah in English) appears in the Hebrew manuscripts of the Old Testament but is usually translated as “LORD” (or occasionally “GOD”). Jehovah’s Witnesses blame apostate Christians for the lack of occurrences of the name Jehovah in the Greek manuscripts of both the Old and the New Testament. The Watchtower argues that “the God-dishonoring tradition of removing the divine name from Greek manuscripts developed only later” in the century or so after the time of the apostles.3 “Apostate Christians of the second and third centuries removed it when they made copies of Greek Bible manuscripts and left it out when they made translations of the Bible.”4 The problem in the New Testament, in the view of Jehovah’s Witnesses, is that copyists who transmitted the text in Greek in the second or third century removed the divine name as they made new copies. The Watchtower Society sought to rectify the problem by “restoring” the name Jehovah to the New Testament in 237 places in their New World Translation, first published in 1950. Jehovah’s Witnesses mount two lines of argument in defense of the use of the name Jehovah in the New Testament. The first line of argument is textual. The Watchtower maintains that the Septuagint—the ancient translation into Greek of the Hebrew Old Testament writings—originally used the name YHWH. In particular, the Watchtower Society claims that the Septuagint during the period of the apostles in the first century used the name YHWH, and therefore it was in the version of the Old Testament commonly used by the apostles (who wrote the New Testament in Greek). The Watchtower’s second line of argument is theological. Jehovah’s Witnesses cite various texts in the New Testament (e.g., Matt. 6:9; John 5:43; 17:6; Acts 15:14) to show that Jesus and the apostles used and reverenced the name Jehovah. The Watchtower infers from these statements in the New Testament that neither Jesus nor the apostles would have condoned the practice of using substitute titles such as “Lord” or “God” in place of the divine name Jehovah. In this article, we will look at the textual issues with regard to both the Old and New Testaments. The next article in this series will discuss the theological issues. Our treatment of the textual issues will be introductory; a thorough examination of all of the claims and counterclaims that have been made on various points of relevance would require a book—and that book would be fully understandable only to persons trained in the study of the ancient biblical languages. Nevertheless, the fundamental questions can be answered quite adequately and reliably without getting lost in the minutiae. What Is the Divine Name? The distinctive Hebrew name for the God of Israel, the Creator of the world, is expressed in the Hebrew texts of the Old Testament as יהוה. Writers from ancient times have referred to this special name by the technical term tetragrammaton (which literally means “four letters”), sometimes shortened in modern scholarship to tetragram. The four letters reading from right to left (as in all Hebrew) would be represented in modern English by the four letters Y, H, W, H, and thus the name is transliterated (represented by the script of another language) into English as YHWH. Ancient Hebrew did not use letters that we would call vowels; a reader would recognize the words from context and in that way know what vowels to use when reading aloud. As will be explained shortly, the exact pronunciation of the name YHWH became uncertain in the centuries after the Old Testament era. Until the twentieth century, the name was most commonly represented in English as Jehovah, a form that first appeared in the thirteenth century (as Jehova). (The letter J was pronounced like Y or I in the medieval era.) 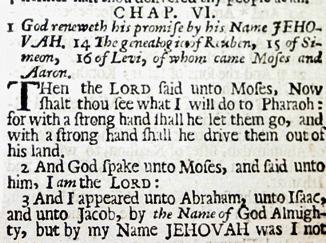 Eventually the name Jehovah found its way into some English versions, most famously in seven passages in the King James Version (as God’s name, Exod. 6:3; Ps. 83:18; Isa. 12:2; 26:4, and as parts of other names, Gen. 22:14; Exod. 17:15; Judg. 6:24). Due to the enormous influence of the KJV, the form Jehovah gained popular currency as the standard Anglicized form of the name. The 1901 American Standard Version (a precursor to the popular NASB) used the name Jehovah consistently throughout the Old Testament. However, since about the middle of the twentieth century there has been a virtual consensus among scholars that the Hebrew form would be more accurately represented in English by the two-syllable name Yahweh. This form of the name is found in some English versions, notably the New Jerusalem Bible (1985) and the Lexham English Bible (2012). The reason why the pronunciation of the name YHWH became uncertain is that ancient and medieval Jews avoided speaking the name aloud. By the time medieval scribes added vowel points (little dots and dashes above and below the consonantal letters) to aid in reading the Hebrew text aloud, the exact pronunciation of the name was quite uncertain. Most (not all) scholars think the vowel points that appear in these medieval Hebrew manuscripts of the Old Testament around the name YHWH are actually the vowel points of another word, adonai (“Lord”), which the Jews had been saying aloud whenever they came to YHWH in the text. When you use these vowels as part of the name YHWH, what you get is a three-syllable form, Yahowah—which may be the origin of the form Jehovah. Even this much, however, is disputed. For our purposes, it probably doesn’t matter how the name was originally pronounced. The spelling Jehovah is perfectly acceptable when translating the Hebrew YHWH. I agree with the Jehovah’s Witnesses’ argument that if English-speaking Christians can use the form Jesus for the Hebrew name Yeshua (for example), they can use Jehovah for Yahweh (or whatever the original pronunciation was). The form Jehovah is found not only in the King James Version but also in orthodox Christian hymns, on church buildings, and in sound Christian literature. Only if the Witnesses claimed that Jehovah is the only correct spelling and pronunciation would their position in that respect be open to criticism. However, they don’t make that claim. Thus, I respectfully disagree with other evangelical Christian writers who have criticized the Watchtower position by saying that if they want to insist on using the divine name they should use the form Yahweh. The oldest and most influential Greek version of the Old Testament was produced in the middle of the third century BC by Jews in Alexandria and was a translation specifically of the Pentateuch (Genesis through Deuteronomy). Over the next two centuries, Greek-speaking Jews produced translations of the rest of the Hebrew Scriptures (what Christians later called the Old Testament). These earliest, pre-Christian translations of the Old Testament are conventionally called “the Septuagint,” even though this name strictly speaking referred to the first Greek version of the Pentateuch. Scholars commonly refer to the Septuagint by the abbreviation LXX (the Roman numeral form of “70”), reflecting the traditional story of its being produced by 70 (actually 72) Jewish translators. Until the twentieth century, virtually all of the known copies of the Septuagint were ancient copies made by Christians as part of their Bible (beginning in the fourth century AD). In these copies, the name YHWH was generally represented using the Greek word κύριος (kurios), meaning “Lord.” This practice continued in versions of the Old Testament produced in Latin and in other languages, including English, up to the present day. In most English versions, to indicate that the term Lord stands in place of the Hebrew name YHWH (rather than a Hebrew word literally meaning “lord”), the term is spelled with all capital letters, Lord. Meanwhile, throughout the past two millennia Jews have avoided pronouncing the name YHWH aloud or even writing it (except in making copies of the Hebrew Bible itself), usually saying “Lord” (in Hebrew, Adonai) in place of the name. Thus, standard Jewish versions of the Bible in English, notably the version produced by the Jewish Publication Society in 1917 and its more recent version in 1985, employ the same practice of using “Lord” in place of the divine name. This manuscript evidence, though meager, could support the conclusion that the Septuagint originally used forms of the divine name YHWH, though what form would remain uncertain. Either the manuscript using the Greek IAΩ or the manuscripts using the tetragrammaton might represent the original reading. Suppose the tetragrammaton was the original reading. Then it would follow that the first-century BC manuscript using IAΩ was a deviation from that reading. Either way, we have evidence of different practices with regard to expressing the divine name in Greek manuscripts of the Old Testament by the first century BC. Once we realize this, we can see how precarious it would be to conclude with any dogmatism that the Septuagint originally used a form of the divine name. Likewise, it would be unwise with the evidence available at present to insist that the Septuagint originally did not use the divine name. We simply do not have sufficient evidence to draw any definite conclusion. This leads us to the question of the practice of the New Testament writers, to which we now turn. The earliest extant Greek manuscripts of New Testament books that quote from Old Testament texts that used the name YHWH in Hebrew were P46, P66, and P75, produced around AD 175-225. That was some 75 to 150 or so years after the books were originally written and long before the Christian movement had gained any political acceptance (let alone power) within the Roman Empire, as it eventually did in the fourth century. In the late second century, Christianity was a quickly growing movement but one that had no centralized or hierarchical authority. Nor was there any guild or pool of authorized copyists acting on behalf of a single or organized religious institution. Serious efforts to standardize the Greek texts of the New Testament used throughout the church did not develop until hundreds of years later. Here is the fatal problem with the Watchtower claim that the New Testament writers used the divine name: the claim inevitably requires a fantastic conspiracy theory to explain how all of the manuscripts that are extant, including manuscripts discovered in the past hundred-plus years, happen to lack the divine name. We have a couple dozen or more New Testament manuscripts dating from before Constantine and not one uses the divine name. Again, the church had no mechanism during the second or third centuries to gather up unacceptable copies of the New Testament writings and dispose of them. The evidence is truly overwhelming that the New Testament writers did not use the divine name YHWH or any form of it, except for the expression Hallelujah in Revelation 19:1-6. As much as any statement of fact can be made about the original wording of the New Testament, this conclusion should be regarded as a well-established fact. On the other hand, since the New Testament quotes the Old Testament in Greek without using the name YHWH, one could view its handling of the Old Testament as establishing the precedent for translating the Old Testament into different languages with substitutes for the name YHWH such as “Lord.” Whatever the practice of the original translators of the Septuagint, this did become the standard practice of Christian copyists of the Greek Old Testament as early as the third century. We may leave this question about translating YHWH in the Old Testament unanswered here. Either way, our handling of the New Testament should not deny the clear fact that in its Greek text it did not use the name YHWH or any form of that name, but instead used substitute terms, mostly “Lord,” where the Old Testament used YHWH. 1. Robert M. Bowman Jr., “Is use of the name Jehovah a mark of true Christians? Answers to Jehovah’s Witnesses #6” (Cedar Springs, MI: Institute for Religious Research, 2017). 2. Close to Jehovah (Watchtower, 2014), 8–9. 3. “Should the Name Jehovah Appear in the New Testament?” Watchtower, Aug. 1, 2008, 22. 4. The Divine Name that Will Endure Forever (Watchtower, 2006), 27. 5. These manuscripts are known as 8HevXIIgr, P.Oxy. 3522, and P.Oxy. 5101. 6. This manuscript is called P.Fouad 266b. 7. This manuscript from the Dead Sea Scrolls is called 4QLXXLevb. 8. Sean M. McDonough, YHWH at Patmos: Rev. 1:4 in its Hellenistic and Early Jewish Setting, WUNT 2/107 (Tübingen: Mohr Siebeck, 1999), 79–84. 9. The number is well over 5,800 and continues to climb as scholars find additional manuscripts. Standard academic introductions to the subject include Philip Wesley Comfort, Encountering the Manuscripts: An Introduction to New Testament Paleography and Textual Criticism (Nashville: B&H, 2005); and The Early Text of the New Testament, ed. Charles E. Hill and Michael J. Kruger (Oxford: Oxford University Press, 2012). 10. This position is taken in Lynn Lundquist, The Tetragrammaton in the Christian Greek Scriptures, 3rd ed. (Cedar Springs, MI: Institute for Religious Research, 2011). IRR maintains Lundquist’s website, http://www.tetragrammaton.org/, due to the generally excellent and detailed information provided there in his free books and articles. However, we do not endorse his view that translations of the Old Testament necessarily should use a form of the divine name (Yahweh or Jehovah).